Standing on your head is probably the last thing you want to do when you’re experiencing vertigo, but it can help move along fluids in your ears. Think of it as an extension to the half somersault. 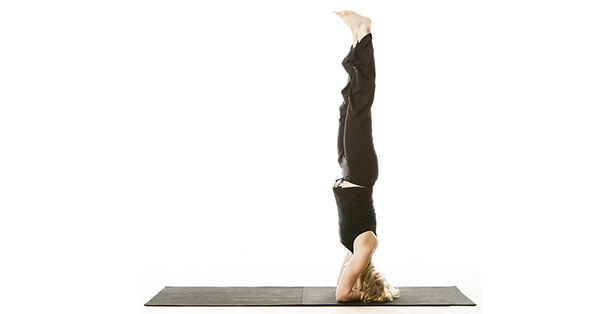 Use a folded blanket or sticky mat to pad your head and forearms and kneel on the floor. Lace your fingers together and set the forearms on the floor, elbows at shoulder width. Roll the upper arms slightly outward, but press the inner wrists firmly into the floor. Set the crown of your head on the floor. If you are just beginning to practice this pose, press the bases of your palms together and snuggle the back of your head against the clasped hands. Inhale and lift your knees off the floor. Carefully walk your feet closer to your elbows, heels elevated. Actively lift through the top thighs, forming an inverted “V.” Firm the shoulder blades against your back and lift them toward the tailbone so the front torso stays as long as possible. This should help prevent the weight of the shoulders collapsing onto your neck and head. Exhale and lift your feet away from the floor. Take both feet up at the same time, even if it means bending your knees and hopping lightly off the floor. As the legs rise to perpendicular to the floor, firm the tailbone against the back of the pelvis. Turn the upper thighs in slightly, and actively press the heels toward the ceiling (straightening the knees if you bent them to come up). The center of the arches should align over the center of the pelvis, which in turn should align over the crown of the head. Firm the outer arms inward, and soften the fingers. Continue to press the shoulder blades against the back, widen them, and draw them toward the tailbone. Keep the weight evenly balanced on the two forearms. It’s also essential that your tailbone continues to lift upward toward the heels. Once the backs of the legs are fully lengthened through the heels, maintain that length and press up through the balls of the big toes so the inner legs are slightly longer than the outer. As a beginner, stay in this position for 10 seconds. Gradually add 5 to 10 seconds onto your stay every day or so until you can comfortably hold the pose for 3 minutes. Come down with an exhalation, without losing the lift of the shoulder blades, with both feet touching the floor at the same time. This pose opens up the neck, shoulders, abs and back muscles. It also helps balance you the nervous system, which is great if you suffer from central vertigo. From Salamba Sarvangasana, exhale and bend from the hip joints to slowly lower your toes to the floor above and beyond your head. As much as possible, keep your torso perpendicular to the floor and your legs fully extended. With your toes on the floor, lift your top thighs and tailbone toward the ceiling and draw your inner groins deep into the pelvis. Imagine that your torso is hanging from the height of your groins. Continue to draw your chin away from your sternum and soften your throat. You can continue to press your hands against the back torso, pushing the back up toward the ceiling as you press the backs of the upper arms down, onto your support. Or you can release your hands away from your back and stretch the arms out behind you on the floor, opposite the legs. Clasp the hands and press the arms actively down on the support as you lift the thighs toward the ceiling. Hold for up to 5 minutes, breathing deeply throughout. This seated forward bend relieves stress and anxiety. It can also help you regain stability when you’re feeling off-balance. Sit on the floor with your buttocks supported on a folded blanket and your legs straight in front of you. Press actively through your heels. Rock slightly onto your left buttock, and pull your right sitting bone away from the heel with your right hand. Repeat on the other side. Turn the top thighs in slightly and press them down into the floor. Press through your palms or fingertips on the floor beside your hips and lift the top of the sternum toward the ceiling as the top thighs descend. Draw the inner groins deep into the pelvis. Inhale, and keeping the front torso long, lean forward from the hip joints, not the waist. Lengthen the tailbone away from the back of your pelvis. If possible take the sides of the feet with your hands, thumbs on the soles, elbows fully extended; if this isn’t possible, loop a strap around the foot soles, and hold the strap firmly. Be sure your elbows are straight, not bent. When you are ready to go further, don’t forcefully pull yourself into the forward bend, whether your hands are on the feet or holding the strap. Always lengthen the front torso into the pose, keeping your head raised. If you are holding the feet, bend the elbows out to the sides and lift them away from the floor; if holding the strap, lighten your grip and walk the hands forward, keeping the arms long. The lower belly should touch the thighs first, then the upper belly, then the ribs, and the head last. With each inhalation, lift and lengthen the front torso just slightly; with each exhalation release a little more fully into the forward bend. In this way, the torso oscillates and lengthens almost imperceptibly with the breath. Eventually, you may be able to stretch the arms out beyond the feet on the floor.